This portrait of his future wife was Cross’s first foray into painting in the Neo-Impressionist style. He had been a founding member of the Société des Artists Indépendants and exhibited at their yearly exhibitions; he counted Paul Signac, Georges Seurat and Théo van Rysselberghe as friends, but he had been resistant to their ideas, being content with a somewhat more conservative style, until this full length portrait was exhibited at the Indépendants in 1891. His conversion came at a time of crisis with the death of Georges Seurat, the intellectual leader of the group. Dubois-Pillet had also died the year before and Camille Pissarro had decided that his dalliance with pointillism had come to an end. Now, with this impressively large and sumptuous painting Cross announced that he had joined the cause. The pointillist technique is beautifully applied but in this picture he does not always adhere strictly to Neo-Impressionist colour theory. Madame France looks over her shoulder as if she is responding unexpectedly to someone (the artist?) while retreating behind the foliage. 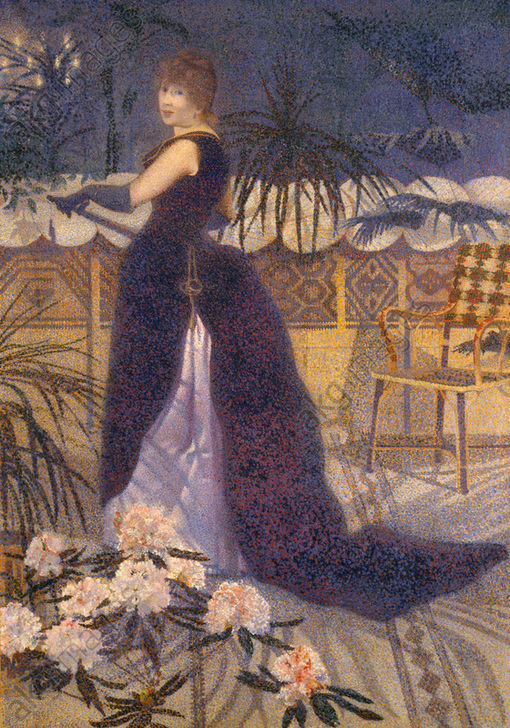 The space in which she finds herself is full of highly patterned surfaces in light browns and dark blue-grey and the rhododendron in the foreground adds to the complexity of the composition but also adds depth to the scene. The subject of the painting was Irma Clare who married the novelist and journalist Hector France, a well known fixture of the Parisian literary world – a milieu also frequented by Cross, Signac and many other Neo-Impressionists. M. France purchased a painting to Cross in 1888 but by the time that Cross was forced by his medical condition to move to the south in 1891, Irma accompanied him. They married two years later.